This is the authentic Mexican Te de Canela recipe like they make it in Mexico. It is remarkable good for your digestion and helps your stomach feel good. Naturally sweet and aromatic it can only be made with Ceylon Cinnamon. Adding sugar is a definite no, because this cinnamon tea is naturally sweet and beautifully fragrant. You will be quite surprised at how sweet it is. Not sugar sweet but an earthy sweet. Besides adding sugar would make it something else. and not Te de Canela. Only Ceylon Cinnamon can and should be used for this recipe. Ceylon Cinnamon is often called Mexican Cinnamon to distinguish it from the cheap Cassia Cinnamon found in the United States. Ceylon Cinnamon is soft and crumbly and perfect for making Te De Canela. Although you don't have to, Ceylon Cinnamon sticks can be crumbled into small pieces for an even better brew. You can’t do that with Cassia Cinnamon which is hard. Ceylon Cinnamon has a sweeter more sophisticated taste, with hints citrus and cloves. Cassia Cinnamon or virtually any other type of Cinnamon tends be more spicy with a more abrasive taste. You simply cannot have that for Te De Canela. If you use lemon then the taste is very different. With the lime this Cinnamon tea is quite remarkable. The lime actually turns the cinnamon tea into a lighter shade and makes it even sweeter. Remember you need to squeeze a teaspoon of lime. Do not put in sliced lime as this will make the Te De Canela overly bitter and thus ruin a perfect blend. In fact it will destroy it. If you follow the instructions to the letter, te de canela will deliver a mild, yet sweet and refreshing flavor with a comforting aroma. If you are taking Cinnamon for diabetes or even weight loss, then this is the perfect way to take it. 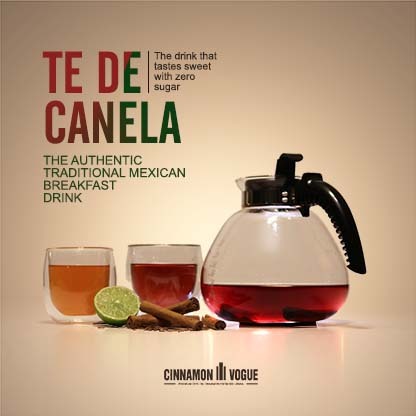 Te de Canela is prepared very much like a normal tea. It's a drink for any occasion, but particularly in the morning, after lunch especially if you have had a heavy lunch and just before bedtime. The smell and taste of Cinnamon has an earthy feel to it, at once comforting and soothing. Break the Cinnamon sticks into small pieces if you wish but not strictly necessary. Bring the water to a slow boil in a pan or stove top kettle. Set the heat setting to medium low or (4/10) so it boils slowly. Boiling slowly allows the Cinnamon sticks to brew properly. This takes about 25 minutes. When the water starts bubbling remove from heat. Let it steep/rest for additional 15 minutes, or to taste based on strength desired. As the water cools you will see the the Cinnamon will start to release and become a lovely red color. Strain the tea through a very fine strainer to ensure none of the small slivers of cinnamon end up in the cup. Add one (4) teaspoon of lime juice. Do not use lemon juice as the taste will be different and sweetness of Cinnamon will not come out if you use lemon. The ratio of cinnamon to water is 3/4 (75%) of a 3 inch sticks. If you make 2 cups that means you need to put in 1.5 sticks. If you make 6 cups that means you use 4.5 sticks. You can also add more water and boil it again. We found our Ceylon Cinnamon sticks could be boiled twice more with good results in terms of flavor. Making Te de canela is the same as making Ceylon Cinnamon stick Tea. The only extra step is adding the lime. Watch the video above or visit the Ceylon Cinnamon stick tea page.